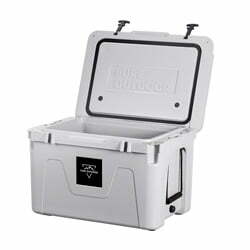 Pure Outdoor Cooler Review - What The Monoprice's Ice Chest Has To Offer? 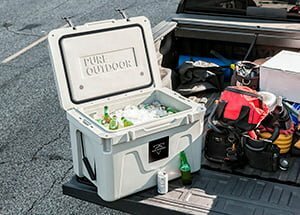 Pure Outdoor Cooler Review – What The Monoprice’s Ice Chest Has To Offer? 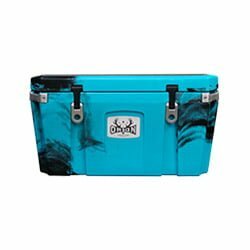 Some coolers are more fit for a good time in the outdoors than others, whether it’s a day on the beach with your family or camping trip in the mountains with you buddies. If you have an occasion in this area coming up, then we recommend getting your hands on the Pure Outdoor Cooler as soon as possible. This option, the brain child of Monoprice, sets out to fulfill its creator’s mission of providing excellent customer service with its design for handling the toughest of environmental factors while ensuring that whatever drinks and food you’re keeping inside are in prime consuming condition. 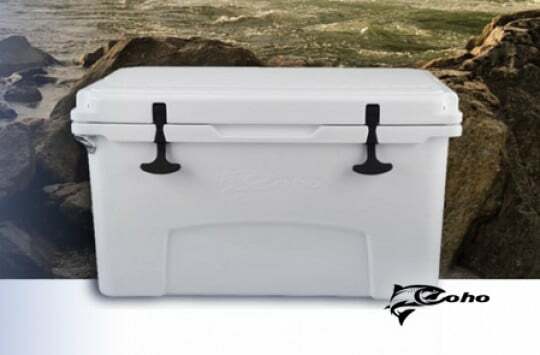 If you want to learn more about Monoprice’s offering in the ice chest market, then read on through this Pure Outdoor Cooler review. 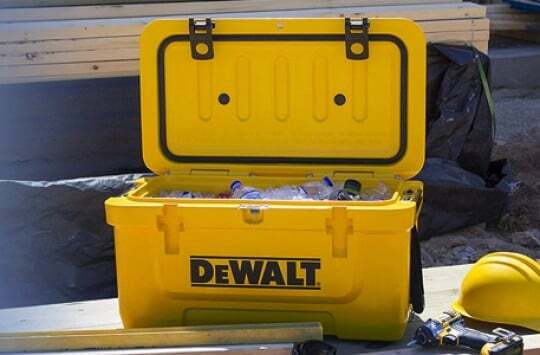 If you want to be able to use your ice chest in any situation that puts you in the easiest or hardest of environments, you need to make sure that it can handle itself. 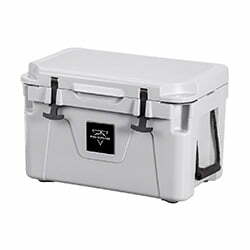 That is not a problem with the Pure Outdoor ice chest, as the outside is made of a roto-molded construction to keep it from getting scratched or dented by rocks, hail, rain and other factors. Security is taken into consideration with this option, as a common issue that campers have to deal with is bears and other large animals coming to the campsite and stealing food and drinks inside the ice chest and making a big mess while you’re away hunting or fishing. 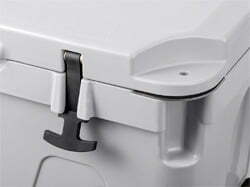 Thankfully, this Emperor cooler keeps these animals out thanks to the durable rubber anchor latches, which are augmented with steel reinforced padlock holes at both front corners. Unless you’re staying in an area known for being occupied by bears that have learned to pick locks, your Monoprice cooler will be fine. 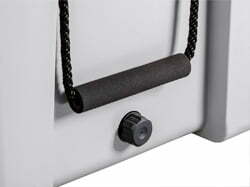 Additional features that ensure that your items stay safe and sound include interlocking hinges that keep the lid from shutting out of place and tie-down slots so you can use tie-down straps to keep the lid down in case the weather gets too crazy, you decide to take the ice chest out on the fishing boat with you, or it’s in the back of your pickup truck and you’re driving on a road consumed by rocks and gravel. 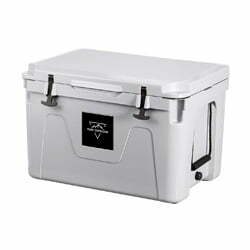 The cooler’s ability to secure items has gained it plenty of praise in online reviews. The non-slip feet also help the ice chest avoid falling over when it starts to rain and you have it propped up on the truck or a large rock while you’re relaxing the grass. This also keeps the cooler still so that it doesn’t slide and knock someone’s feet out from underneath them. In case you weren’t sure about Monoprice’s expertise with coolers that are used in this sort of environment, then you’ll be happy to know that this company specializes in outdoor products, providing everything from survival gear and bike components to electronics like flashlights and solar chargers. 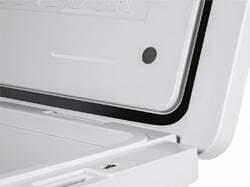 Having a cooler that guarantees cold beer, water and soda when you open it is a major concern for all owners and potential buyers, and Monoprice makes this a non-issue with its ice chest. This one will keep your ice from melting for over 130 hours, making it perfect for a five-day vacation in case you have an extra-long weekend coming up for a holiday or decide to finally use those vacation days that you’ve been saving. Like very few options in the cooler world, this one also makes sure that your items are hot enough for proper use, as it can keep items hot for more than 150 hours, making it perfect to use if you plan on staying in the outdoors for around six days. This insulation is designed to deal with the most extreme of weather conditions, whether they be a snow storm or a heat wave, making it perfect for keeping items hot or cold, depending on what you’re bringing with you and where you’re going. Some cooler brands stick with the necessary features when it comes to providing ice chests, but the Pure Outdoor cooler helps make your drinking experience extra convenient with the addition of a bottle opener in case you or your friends forget yours at home. You won’t have to worry about any trouble with getting rid of melted ice at the end of your vacation, as the drain system makes dumping water in a clean and quick fashion a piece of cake. You’ll have three options when it comes to sizes when buying Pure Outdoor ice chests, depending on how much you plan on bringing with you to the camping trip. 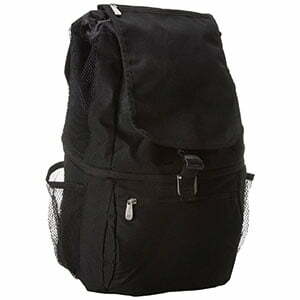 The Emperor 25 option, which can carry up to 25 liters, is the lightest choice and weighs 23.6 pounds. The outside measures 22.8 in. X 15 in. X 15 in. while the inside measures 16.7 in. X 10 in. X 10.8 in. The Emperor 50 option can carry up to 50 liters and weighs 33.3 pounds. It measures 27 in. X 19.2 in. X 18 in. on the outside and 20 in. X 13.3 in. X 13 in, on the inside. The Emperor 80 option can hold up to 80 liters and weighs 44.1 pounds on its own. The outside measures 30.8 in. X 22 in. X 20.7 in. while the inside measures 24 in. X 16 in. X 15.4 in. 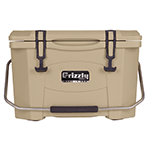 Handles are included on the sides of all of these options in case you plan on packing your cooler up to the lid and might need a helping hand to bring it to and from the truck. Monoprice ensures that you’ll have a great user experience with its cooler by providing a lifetime warranty that protects it from defects in material and workmanship. This puts the brand on par with Pelican and makes it a better choice in this area than RTIC, which will only keep you covered for one year, and Yeti, which guarantees five years. Both of these options are designed to hold off animals and severe weather conditions so that whatever drinks, food, equipment and other material that you have locked up inside stays there and in the right condition to consume when you plan to. The one area where Yeti outshines Monoprice is in the size offerings. The Emperor series’ sizes and dimensions are in the same range as Yeti’s Roadie 20 and Tank 45 and Tank 85 in case you feel like carrying light for your trip. 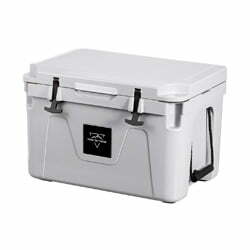 However, Yeti’s Tundra series offers much bigger coolers, with the biggest option being the Tundra 350, which weighs 89 pounds, can hold up to 259 cans of beer, and measures 24.75 in. X 23.25 in. X 63.5 in. on the outside and 16.75 in. X 17.75 in. X 54.625 in. on the inside. This is due to the fact that the larger Tundra coolers are designed more for containing deer, bass and any other game you caught on your vacation. 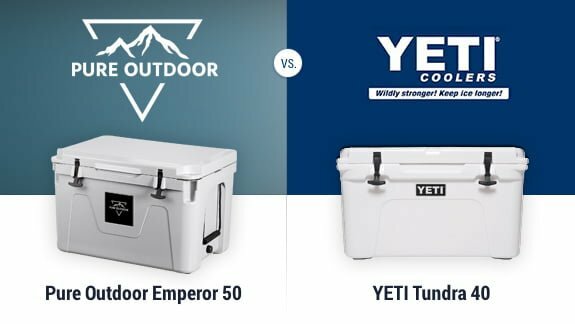 However, the smaller size options allow the Pure Outdoor coolers to help customers save money, offering about $130 for the Emperor 25, about $200 for the Emperor 50 and about $250 for the Emperor 80 – at least last time we checked the prices. While Yeti’s Roadie 20 and similar-sized options are in the same price range, costs go up from there, with the Tundra 350 costing you well over $1000. 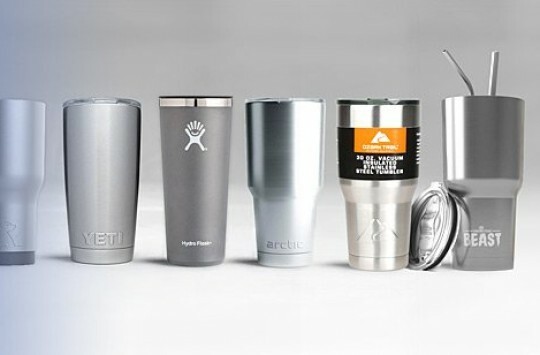 If you intend to rely on brand name when it comes to picking your ice chest or have a hunting trip that requires a large game to take home, then you should stick with Yeti. However, we recommend Monoprice cooler if you want to spare your wallet and wish to have a cooler that gets the job done just as well as big-name brands. Pure Outdoor Emperor Coolers For Sale – Where to Buy? We recommend checking out Amazon to get your hands on Monoprice’s Pure Outdoor ice chests so that you can get them at the really good prices. Visiting this site allows you to view reviews from customers to assure that you’re making the right choice, and you have the option of returning your cooler in case it doesn’t work the way you wanted it to. Amazon Prime members get to enjoy free shipping, which should help you save even more money if the prices of these ice chests weren’t helping enough in this aspect. You also have the option of going to Monoprice’s website if you want to learn a bit more about the company, or if the prices change from site to site. You should get your hands on any of Monoprice’s Pure Outdoor coolers as soon as possible if you have a trip in the mountains or by the river coming up and need something to keep your drinks and food in. These offerings are strong and secure enough to keep bears from getting in and stealing your food, and the weather won’t cause a dent to the outside or mess with the locks. 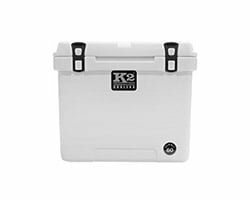 The opportunity to save money is prime with this brand, as you won’t have to spend more than $250 on the biggest ice chest. Take these Pure Outdoor ice chest into consideration so that you are refreshed and have a relaxing time while you do some star gazing under the mountains at night. We recommend Monoprice’s Pure Outdoor coolers if you want to spare your wallet and wish to have a cooler that gets the job done just as well as big-name brands.